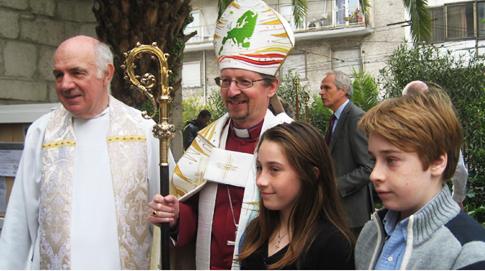 IN MID-JANUARY 2015 Bishop Robert visited Greece as a guest of the Archbishop of Athens and also spent time with Fr Malcolm and members of the Chaplaincy. He met with representatives of Anglican congregations from Athens, Crete, Corfu, Patras and Nafplion, in order to discuss the new Constitution of the Anglican Church in Greece, and he and Fr Malcolm also visited some of the organisations we work within our outreach programme. One visit included detention centres for minors – boys mainly from Syria and Afghanistan – and, as a result, clothing and personal items will be collected and delivered to the centres. The Bishop’s Lenten Appeal will this year be focused upon an Athens hostel for unaccompanied minors who are refugees and immigrants, run by Apostoli. He visited Apostoli, the administrative centre for the welfare work of the Orthodox Church and then had lunch at the Kokkori residence for those living with Down Syndrome, which the Chaplaincy supports. He had the opportunity to meet Mrs. Katia Papaconstantinou who is sponsored by the Chaplaincy and provides emotional needs lessons and parenting courses at Dilessi kindergarten close to Kapandriti.